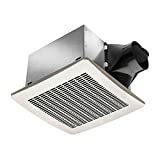 By Delta Electronics (Americas) Ltd.
A bathroom exhaust fan is one of those home accessories that most people probably don’t think about very much—in fact, most people probably aren’t even sure of what it does—but it is, in fact, a very important piece of equipment. 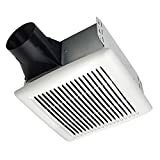 The main purpose of the fan is to regulate the moisture level in the area, which is essential when you consider how much water and steam are present in the average bathroom. In addition, a fan helps to keep the temperature in the room reasonably constant. This is important—and not just to keep the bathroom mirror from fogging up during a shower—regulating moisture and temperature can help to prevent damage to walls, mold growth, and other undesirable situations. If you find yourself in need of a new exhaust fan for your bathroom, here are some things to look for. 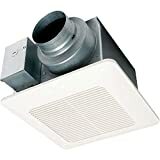 Lights: The most common add-on to an exhaust fan setup is a light, which makes sense: having the bathroom light and exhaust fan in the same fixture is an efficient use of ceiling space. 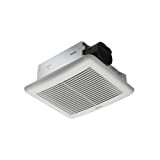 Heaters: Some exhaust fans come with heater attachments. They aren’t strong enough to do the job of the home heating system, but they are good for taking the edge off of the bathroom’s air on a cold morning. Decorative: When you think about exhaust fans, you probably think of straightforward, functional designs, and with most fans, that’s exactly what you get. However, some models come with decorative covers to make things look a bit fancier. Ease of installation: Unless you’re paying for professional installation (which might be a good idea), it’s important to find a model that attaches easily to the bathroom’s pre-existing ductwork and attaches to the ceiling without too much work. The best models do both of those things. 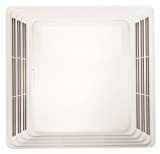 Drying/dehumidifying power: The main purpose of an exhaust fan is to keep the bathroom’s moisture in check. Great fans do just that, quickly getting excess moisture out of the air before it can damage the room. Noise: It’s essential that the fan does a great job at regulating the bathroom’s moisture level, but it would be even nicer if it can do it without an excessive amount of noise. Better models aren’t so quiet that users forget that they’re on—there will always be some noise—but they aren’t so loud as to be distracting or annoying. Rusting: Since they work with moist air, it’s important that the fan’s parts are, to some extent, rust-resistant, or else it will need to be replaced much too soon. Good brands feature parts that are long-lasting and rust-resistant. Fit with ductwork: This is an essential quality. 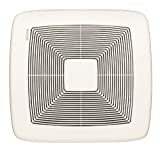 If the fan doesn’t fit with your bathroom’s ductwork, you will either need to make modifications or purchase an adapter. It’s much better to take the time to look at the fan’s specifications and pick one that will fit with the equipment you already have in place. Humidity sensing: Some fans come equipped with sensors that detect how much humidity is in the air and shut off when it reaches an acceptable level; this might be a useful option for you. 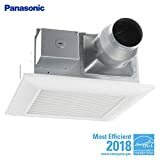 Efficiency rating: If you’re interested in cutting down on your energy consumption, it’s worth your time to check out a fan’s energy efficiency rating; many brands—and certainly brands that boast excellent ratings—will include this information in their product specifications. 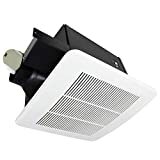 Materials: Metal and plastics are the most common materials used in exhaust fans, and each material has its own strengths and weaknesses when it comes to durability, weight, rusting, and other considerations. Delta Breez: Delta Breez is a branch of Delta Products, a Taiwanese company that has produced fans and related products since 1971. Delta Breez produces an array of fans for every room in the house, including a number of energy-efficient models. Air King: Air King specializes in producing ventilation systems and fans for both home and industrial settings. 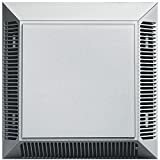 Broan: Broan is an American company that has been manufacturing home ventilation systems, heaters, and other equipment since 1932. Ventline: Ventline is an American producer of ventilation systems for homes and recreational vehicles. 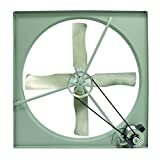 Established in 1965, today, the company produces a range of fan options for homeowners.